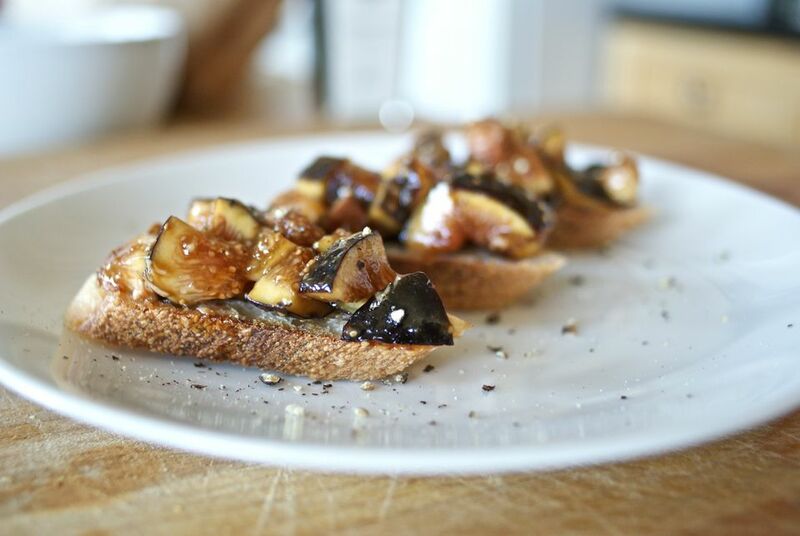 Fig crostini is as simple as it gets: Chopped fresh figs (any variety works nicely here) get tossed with a bit of balsamic vinegar and black pepper, placed on slices of toasted baguette and then topped with cheese if you like. Although made with just a few ingredients, when combined they taste like so much more—or, rather, they taste so good you don't want to add anything else that might muck things up. Just make sure you use a good-quality balsamic vinegar; a low-grade one will add bitterness to the dish. While the fig mixture can be prepared in advance, and the bread can be toasted ahead of time, for the best results, don't top the crostini until ready to serve. Rinse the figs clean and pat them dry. Trim off any excess stem ends from them and chop the figs. Put the chopped figs in a medium bowl and toss with the vinegar, pepper, and salt. Let the figs sit for at least 15 minutes and up to 1 hour to let flavors blend. Meanwhile, lightly toast the baguette slices. Brush with olive oil and place in a single layer on a baking sheet. Put in oven for about 7 minutes, turning once, until lightly golden. Taste the fig mixture and adjust seasoning to taste. If using goat cheese, spread about 1 tablespoon on each baguette slice. Top each with an even amount of the fig mixture. If using blue cheese, dot it on top of the figs. Serve right away so the texture of the toasts isn't compromised. Fresh figs are available two times a year: a small harvest early summer and a larger harvest late summer/early fall. The second harvest yields figs that are sweeter with thicker skin. There are hundreds of varieties of figs, but the most common are Black Mission, Brown Turkey, Adriatic, Kadota, and Calimyrna. When buying figs, make sure they are plump and soft with their stems intact (and it is okay if the stems are bent). Avoid figs with dry, cracked skin but a little bit of bruising or cuts is all right. Figs don't ripen once picked, but if you come home with some hard fruit, you can leave on the counter for a day or two to see if they soften. Otherwise, store in the refrigerator in a single layer and use within a few days. To take advantage of the fig season, try other quick fig recipes, such as bacon-wrapped figs and broiled figs.